It’s autumn. So let’s make autumnal onigiri. 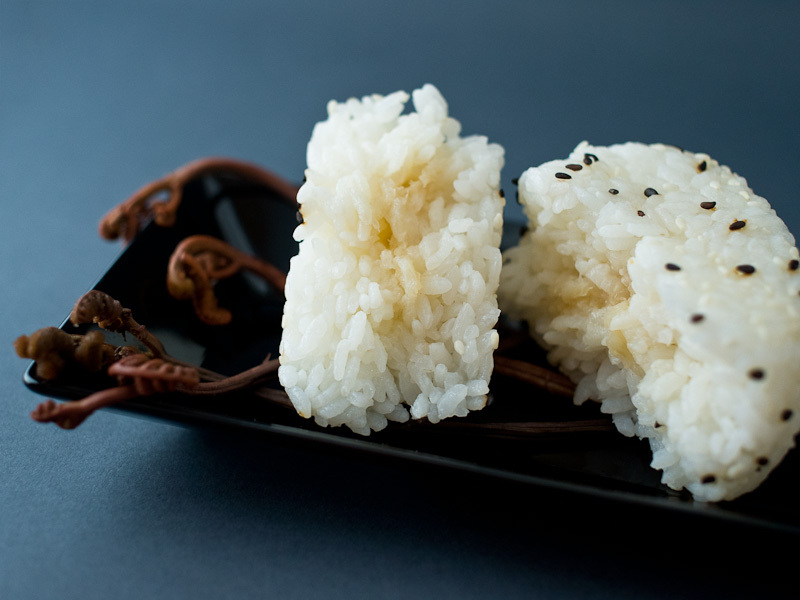 Onigiri are a popular snack in Japan, made from white rice. It is usually shaped like a triangle and filled with a savory ingredient, such as fish, seaweed or eggs. Sometimes this ingredient is mixed with the rice. And most of the time, the rice triangle will be served wrapped in a nori sheet. We are going to do something a bit special here: we’ll use Jerusalem artichokes in this recipe. It is seasonal, it works perfectly in a Japanese dish, but it is not Japanese at all. Jerusalem artichokes are not related to artichokes in any way. They are the roots of a plant close to sunflowers, with the same kind of big yellow flowers and all. And they don’t come from Jerusalem either, but from North America. Only English speakers use this name: it comes from a misunderstanding of the Italian word “girasole”, meaning sunflower. The English understood “Jerusalem”, and the name stayed. 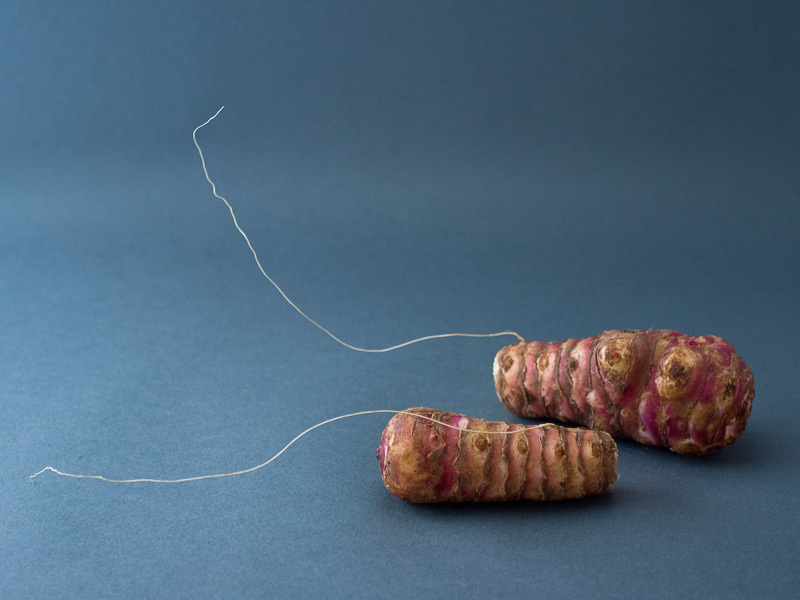 In France, we have another weird story with the name of this root: we call it “topinambour”, a word coming from the name of a Native American tribe of the Amazon. Those Indians, the Tupi people, or Topinamboux in French, have made people talk a lot at that time, as they were famous for being cannibals. And as French people heard from this tribe and from this new root -both from the new world- at the same time, at the beginning of the 17th century, they imagined they had been encountered at the same place. But it was not true at all. Those Indians will never see that kind of root in the Amazon, as it only grows in temperate climates. It was found in Canada by the Europeans. Still the name stayed, here again, even though it was a complete mistake. 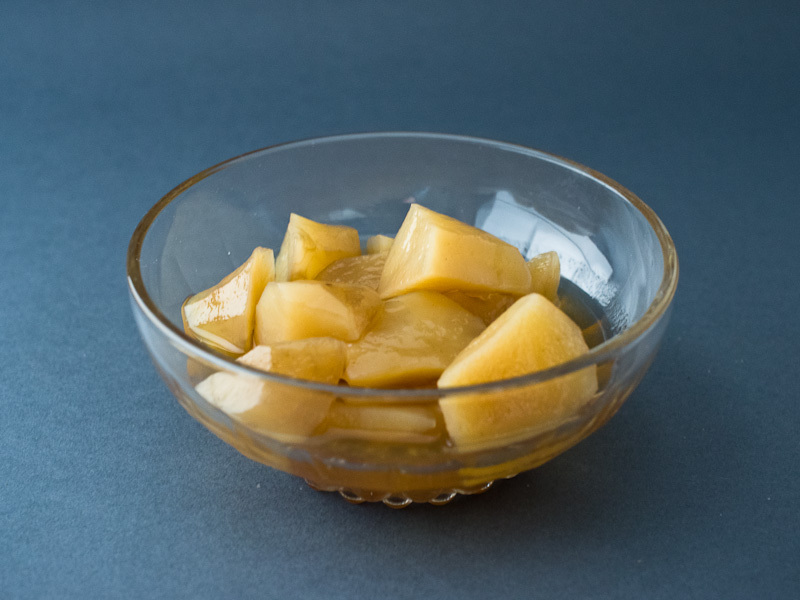 Jerusalem artichokes were brought back to France in the early 1600′s by the explorer Samuel de Champlain who had noticed they tasted a lot like artichokes. So there you have it, the complete origin of the English name is here. By the way, Samuel was right. It does taste like artichokes, but the aromas are more subtle. And even though it doesn’t look very glamourous, it is very easy to use. You can cook it any way you cook a potato for instance. Just peel it, parboil it (with a bit a vinegar so it doesn’t turn brown) and it will be ready to become anything you want. You can go with a purée, a soup, a simmered dish, whatever. In France, it is relatively easy to find Jerusalem artichokes on the markets in the fall. It had almost disappeared after World War II as people were sick of eating only this root during the long years of conflict. But it is getting easier and easier to find them. And if you wonder if the same thing happened to the Topinamboux, well, no. I mean, they almost disappeared, yes. But that’s the end of the story. According to the freshest news, there are only 50 of them remaining. The quantities will depend on how much Jerusalem artichokes you want to prepare. Read the next two lines first and you will get your answer. Put the dashi, mirin, and sake in a pot. Bring to the boil. Add the Jerusalem artichokes. The sauce must not cover them. The level of the sauce, when the roots are in it, should not exceed half the height of the root pieces. Add a little touch of soy sauce, really, just a little bit, some salt, and bring to the boil again. Then turn down the heat, and let simmer for around 15 to 20 minutes with a lid on, until the roots are completely tender. Honestly, only this is already delicious. 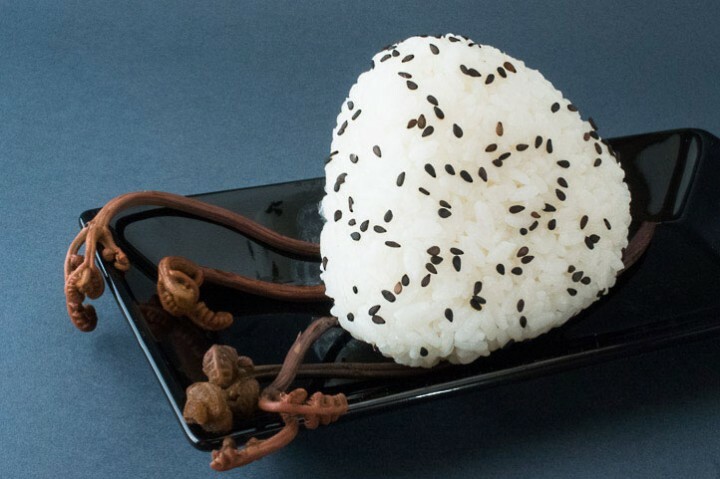 You can eat them right away if you don’t want to make onigiri anymore. You can eat them with rice, or mashed, or as a soup, if you put them in a blender with the sauce and a bit of cream or goat’s cheese. I have taken some pieces, without the sauce, and mashed them with a fork. The equivalent of two pieces is enough to fill each onigiri. By the way, for the onigiri, you will need rice. Just simple Japanese rice, cooked in the exact same way as sushi rice (with a bit of vinegar and sugar). You should use warm rice for best results, but not hot! You won’t be able to do anything with it if it is really hot. Then you have two options: the cellophane or the free style method. If you choose the first one, then you’ll need some cellophane, and the technique will be similar to the temari sushi. The main difference is the size of the rice ball. You will have to use about 2 to 3 tablespoons of cooked rice for each onigiri. 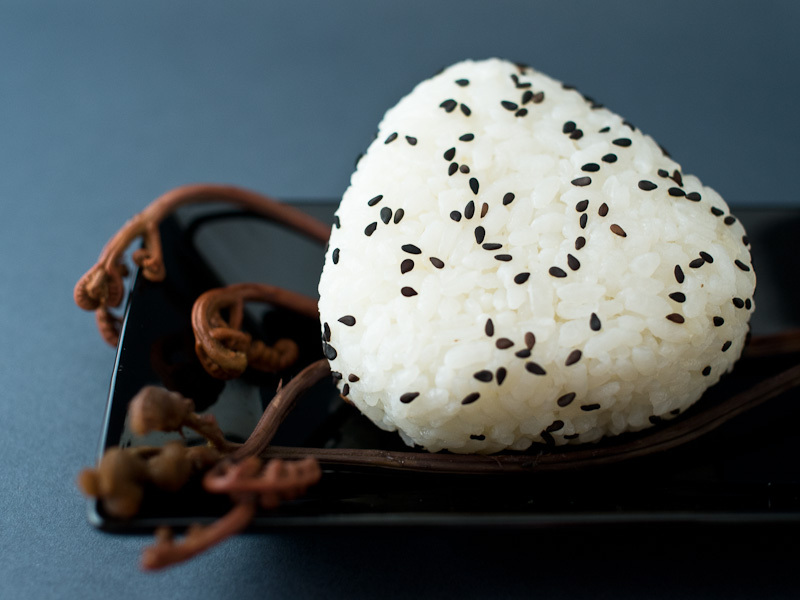 And you won’t put the ingredients on top of the rice like with temari sushi, you will hide them inside the rice triangle. You just have to put the rice you need on the cellophane. Then you will make a dent in the the center of your pile of rice and put some mashed Jerusalem artichokes in it. After that, you will have to form a ball of rice around the filling so it stays right at the center. You will give it a nice triangle shape at the end, when it is firm and really sticks together. The first one might look bad. Don’t worry, the second one will look better. If you use the free style method, you won’t need any special tool. But you will have to rinse perfectly your hands and sprinkle some salt on it. Put the rice on one of them, and do as above: dent, filling, ball of rice, triangle. The only difference is that you use your bear hands, really, it’s not more difficult. If the rice sticks too much to your fingers, prefer the cellophane option. It is more tolerant with the quality of the rice. I’ve decided not to use nori, just some toasted sesame seeds that I’ve sprinkled on top of my onigiri, with a pinch of salt. You can eat it warm, or cold, just like that, no need to add anything. Please don’t dip it in soy sauce, the taste of the Jerusalem artichokes is not as strong and it will completely destroy the balance of this sweet and savory onigiri. I’ve served it with fernbrakes, called warabi in Japanese. In Japan, they’re usually simmered with soy sauce and sugar. And to continue with the seasonal roots and vegetables, I’ve made some Japanese winter squash onigiri, recipe coming soon. And in the end of this next recipe, for those who really are not able to make onigiri, I’ll give an alternative to the Jerusalem artichoke and winter squash onigiri, much simpler, but using the exact same ingredients: a vegetarian autumnal chirasi.